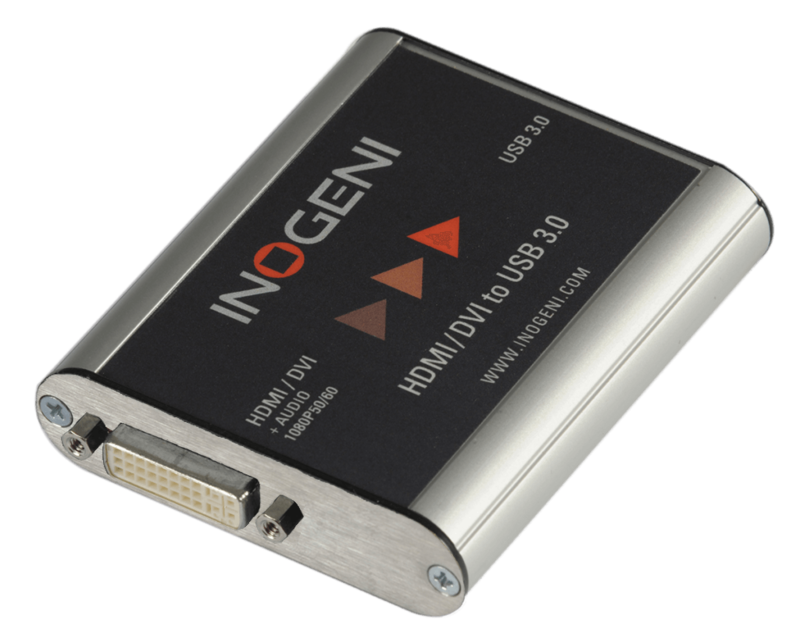 The INOGENI DVIUSB Converter requires no drivers and works on all motherboards and USB 3.0 chipsets. It is the most reliable and convenient PC input to capture uncompressed video with audio from your camera's HDMI or DVI-D output for recording, editing, videoconferencing and streaming applications. It is compatible with Windows, Mac OSX, Linux, and Android operating systems. The INOGENI DVIUSB features a single HDMI input and USB 3.0 output, and supports SD and HDTV video formats, up to 1080p60, as well as most computer graphic formats. Compact in size and powered directly from a USB 3.0 port, the converter is a practical and easy-to-use USB 3.0 capture solution. It is compatible with Windows, Mac OSX, Linux, and Android operating systems, and is UVC-compliant, so it will work with all DirectShow compatible software. The DVIUSB supports 1080p resolutions up to 60 fps. Supports 1920x1200, 1280x1024, 1280x960, 1024x768, 800x600, 640x480 graphic formats up to 1080p at 60 fps. All SD and HD resolution signals are converted to 4:2:2 8-bit color space over USB 3.0. A USB 3.0 cable and DVI to HDMI adapter are included. Frame Rates 60, 59.94, 50, 30, 29.97, 25, 24, 23.98 Hz for all resolutions.